From the above result it is clear that even-though @ToDate is the next day from the @FromDate, but still the difference returned is 1 year. So based on the need use the appropriate approach. If we need to calculate age, then we should be using the Approach1. From the above result it is clear that even-though the @ToDate is the next day from the @FromDate, but still the difference returned is 1 Month. So based on the need use the appropriate approach. From the above result it is clear that even-though the @ToDate is the next second from the @FromDate, but still the difference returned is 1 year. So based on the need use the appropriate approach. 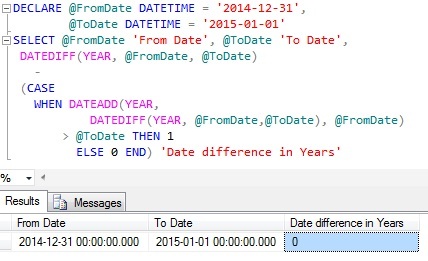 We can use a script like below to get the difference between two dates in Years, Months and days. 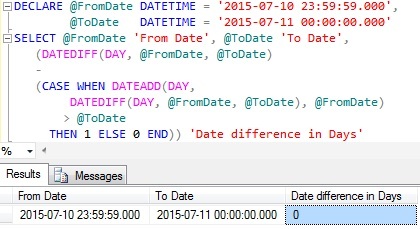 My friends Bienvenido, Oscar and me made some modification to the function to show only the data that has values. 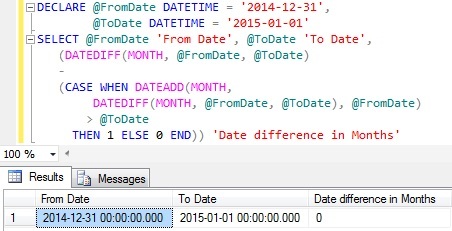 When I use the function for date specified below, it’s giving me 30 days instead of 1 month. 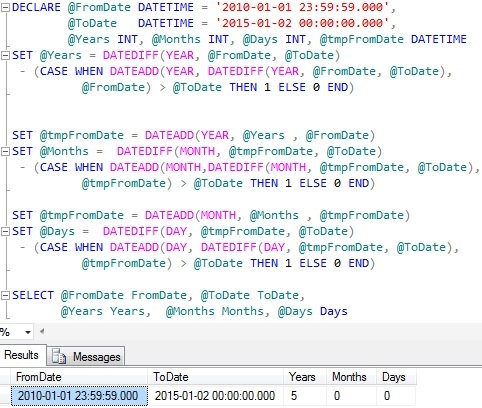 How can i update the function? April has 30 days it gives 1 month for 2010-05-22 and 29 days for 2010-05-21.